Toulouse (anc. Tolosa), a city of France, in Languedoc, capital of the department of Haute-Garonne, on the Garonne, 130 m. S. E. of Bordeaux; pop. in 1872, 124,852. It includes an island in the river, and the suburb of St. Cy-prien, where 25,000 workmen resided before its destruction by the floods of 1875. It is more remarkable for historical associations and for its active industry than for external attractions. The square is called after the capitol or town hall, where the once famous floral games are still annually held under the auspices of a literary society. The church of St. Sernin is more remarkable than the cathedral, and is a masterpiece of Romanesque architecture, recently restored by Viollet-Leduc. 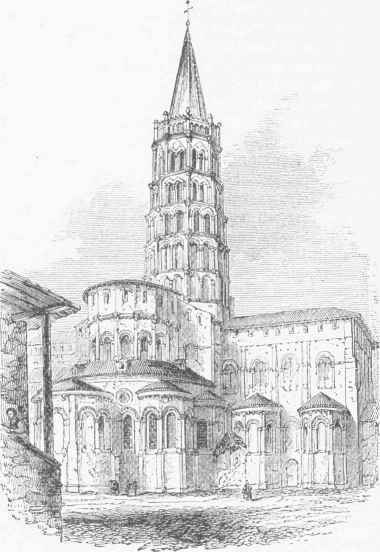 The church of the Cordeliers, of the 13th century, was destroyed by fire in 1871. Toulouse has one of the richest museums of art, located in a former monastery, and various learned institutions, a public library of 60,000 volumes, an observatory, and an arsenal. The palace of justice was formerly the seat of the Toulouse parliament. The trade with both the Mediterranean and the Atlantic is active. Woollen and cotton goods, cutlery, hardware, and many other articles are manufactured. - Toulouse is of great antiquity. It became the capital of the Visigoths in the 5th century, and subsequently of the duchy of Aquitaine. Local counts or dukes were the rulers from the end of the 8th till late in the 13th century, in the early part of which a crusade was carried on against Counts Raymond VI. and Raymond VII. (See Albi-genses.) Philip III. annexed it to the French crown, under which it remained the capital of Languedoc till the revolution. During the middle ages it was the seat of numerous councils. The memorable battle of Toulouse, April 10, 1814, resulted in Wellington's signal victory over the French under Soult. The inundation of the Garonne on June 24,1875, caused the loss of a vast number of lives and immense property.